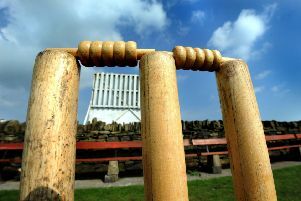 On a warm and windy day at the Castle Field, Blyth maintained their top position with a six-wicket win over Warkworth. Electing to bat after winning the toss, the home side opened with Puddephatt and Scott Gibson, while Andy Kemp and Dave Ebdale took the ball for Blyth. In Ebdale’s first and only over, Puddephatt edged through the slips for two fours. Gibson then sent a Kemp delivery to the boundary in his next over before Lawrence came on to bowl one over to switch Kemp to the road end while Asher took over at the Castle end, and he struck with his last ball of the over, Ebdale catching Puddephatt in the slips. Wilson was next in and with Gibson the score was more than five an over. Gibson was starting to up the pace with a few boundaries but he mistimed a lofted drive and was caught by Carr at mid-off to give Asher his second wicket. Hall was next to join Wilson who was having a charmed life being dropped twice and very lucky not to be stumped a few times. Hall was next out, lbw to Asher for six. Skipper Douglas was next in to join Wilson, and this pair held up the Blyth bowlers before Lawrence brought himself and Andy Ebdale into the attack. Douglas took 12 from Andy Ebdale’s his first over, but he then bowled Wilson for a dogged 30. Wilson and Douglas had put on fifty-eight for the fourth wicket. Pringle came in next, however, with only four runs added, Ebdale trapped him lbw with out scoring. Anderson was next in but his stay was short as Lawrence trapped him lbw without scoring. Lawrence struck again twice in his next over, bowling Smith for two, and the next ball new batsman Gibson was caught by keeper Roberts. Clark came in and survived the hat-trick ball, however, with the score on 144 Douglas went for another big shot and was caught by Asher off Ebdale for an excellent 47. Tittrington was last man in and the final pair added 26 before Asher trapped Tittrington lbw for six. Clark remained 13 not out. Blyth bowling figures were A Kemp 0-26, D Ebdale 0-8, M Lawrence 3-26, W Asher 4-56 and A Ebdale 3-41. Blyth’s reply began with Clark and Asher, who got off to a flying start with two fours in the first over. Blyth were well in front of the run rate and brought up the 50 in the tenth over. But, with the score on 66, Tittrington bowled Asher for 39. Rowell was next in, but with four runs added, Tittrington trapped him lbw for one. Andy Ebdale joined Clark and they put Blyth in the driving seat. The hundred came up in the 20th. Clark reached his 50 as he and Andy Ebdale moved the score onto 124 before the latter bowled for 24. Lawrence was trapped him lbw for one then Andy Clark went for 66 including nine fours and one six. Hudspith was next in but a superb catch by Wilson brough about his dismissal. But Smith sent the ball to the boundary three times in four balls to see Blyth to victory as he finished 28 not out and Carr unbeaten on five. Blyth seconds’ game at home to Monkseaton thirds was off due to Monkseaton unable to field a team. Blyth gained the full 30 points. This weekend Blyth are at Blagdon with a 1pm start while the seconds have a free week.